Kennedy, Dorothy and Randy Bouchard. 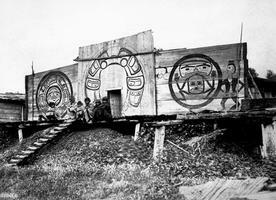 "Nuxalk (Bella Coola)". The Canadian Encyclopedia, 16 October 2018, Historica Canada. https://www.thecanadianencyclopedia.ca/en/article/nuxalk-bella-coola. Accessed 22 April 2019. The Bella Coola village of Qomq'-ts was located at the mouth of the Bella Coola River in BC. The painted houses were owned by people of high rank. 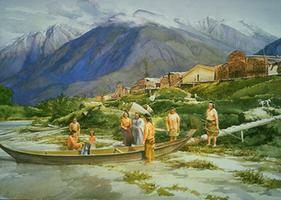 The large baskets are traps used for catching salmon in the river (artwork by Gordon Miller). The Nuxalk live in an isolated fishing village on the central West Coast of British Columbia. In 1996 their registered population was 1185, with 706 people living on the reserve. The term "Bella Coola" once referred collectively to the Nuxalk, Talio, Kimsquit and some Kwatna who inhabited villages around North Bentinck Arm and the Bella Coola Valley, South Bentinck Arm, Dean Channel and Kwatna Inlet. By the 1920s they had abandoned all their other village sites and amalgamated on the present reserve at the mouth of the Bella Coola River. Since the late 1970s the Nuxalk have called themselves the "Nuxalk Nation," derived from the term that in earlier times referred exclusively to the people of the Bella Coola Valley. 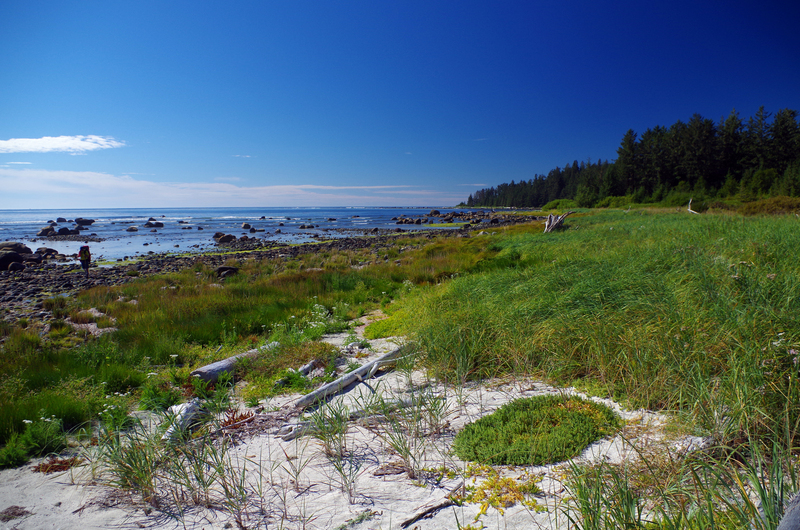 They speak a Coast Salish language known as Bella Coola that is isolated from the other Salish languages of the coast and forms a linguistic island surrounded by Dene and Wakashan languages. 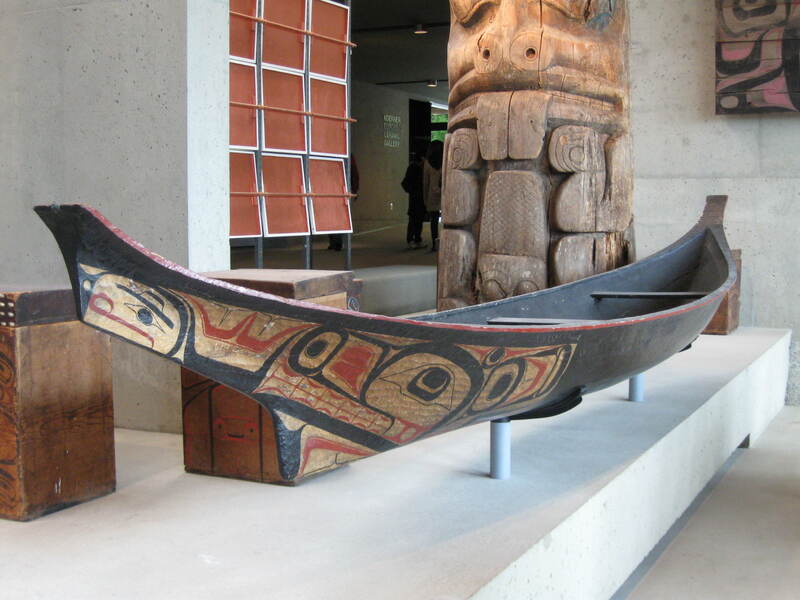 Culturally the Nuxalk are most similar to their Wakashan neighbours, the Heiltsuk (Bella Bella). Villages traditionally consisted of descent groups who traced their lineage to a group of mythical first ancestors. Each group of ancestors, equipped with tools and ceremonial knowledge, descended from a mountaintop and established a village at its base. Through marriage, a network of descent groups developed that linked the villages. Most people chose to live in their fathers' villages. However, they were also related to their mothers' descent groups, if different. The multiple-family cedar-plank dwellings were large enough to house as many as 6 couples and their children. Members of the household, which included elderly relatives, supported one another in potlatching and economic pursuits. The most prominent characteristic of Nuxalk life was its extremely rich and complex ceremonialism dominated by the potlatch and 2 secret societies, the sisaok and the kusiut. Membership in the sisaok was limited to the children and certain relatives of chiefs. Initiation included a period of seclusion, followed by a public display of a masked figure representing the initiate's crest. Members performed at potlatches and funerals and occasionally at less important ceremonials. The Nuxalk were a fishing, hunting and gathering society. Salmon and eulachon ("candlefish") fishing in the Bella Coola River continues to be important. Each year, eulachons are netted, rendered into grease and traded. The fish are smoke-dried in the traditional manner, canned and frozen. Band administration, a band-operated commercial ice plant, forestry, commercial fishing and salmon-enhancement programs provide employment. The first recorded encounter with the Nuxalk occurred briefly in the summer of 1793 when Captain George Vancouver entered their waters. He was followed only weeks later by an overland exploration team headed by Alexander Alexander Mackenzie. 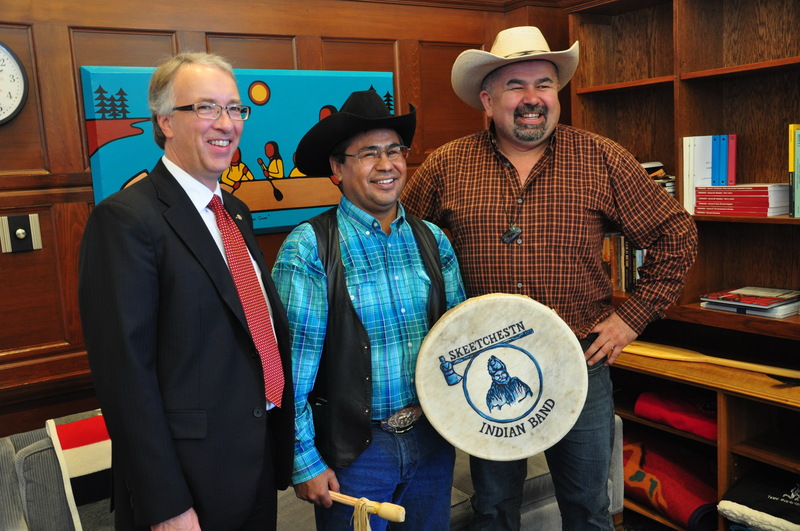 This historic occasion became incorporated into Nuxalk oral tradition and the story of the welcome they gave Mackenzie is still a source of pride. See also Aboriginal People: Northwest Coast. T.F. McIlwraith, The Bella Coola Indians (2 vols, rev 1992); C. Mack, Bella Coola Man: More Stories of Clayton Mack (1994).